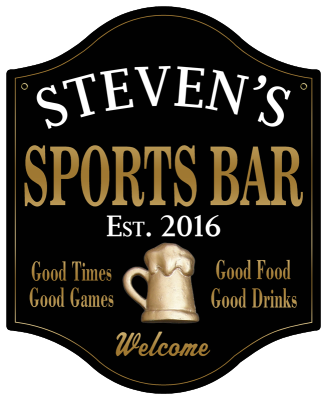 Ideal for a home bar area, this Personalized Sports Bar Sign with Beer Mug 2 - Metal comes with your name and second line of text. Ideas for the second line of text could be the year you established your home bar or your city and state, a favorite saying or even a declaration about your favorite team (Eg. SEAHAWKS HEADQUARTERS). A Man Cave Gifts Exclusive!